Latest Update: Install crew will meet at Cactus at 9:30 am SATURDAY morning (any helpers are welcome), and we'll bolt it into the rock up there for dedication ceremony on SUNDAY to take place at 10 am. Almost a year has passed since the accident that claimed the life of our friend and fellow pilot, Johan Håkansson. We have asked Phil to make a bronze plaque in time for the anniversary of that day. Let's get together on Sunday, October 21, to dedicate the plaque at Makapuu, and celebrate Johan's memory. If you have strong feelings about the wording, please let me know. We are currently deliberating between installing the plaque at Cactus or Manics launch, in a location where only pilots would be likely to notice it. I like it Alex. It looks like I will be available both days. The next question is where to put it. I think your idea of Manics ( from the start of his fateful flight) is a great idea. Cactus is also a good choice because the public won't see it much, and it is kind of a hang out launch. Anyone have a spare park bench? I like manics. I think on the back side of the wall where we put our bags prior to launch would be great. Manic's sounds good, but what if they re-align the road or something? I like the wording, and Phil says his artist will add a nice paraglider, such as the one he did for Dixon White's plaque. Here is a picture that Greg took of Dixon's plaque in Arizona. The paraglider image is nice but it really makes it a more ornate presentation -- which is appropriate at Dixon's memorial flight park. But Johan's plaque needs to be humble and unassuming, not only to match our memory of Johan but also because it'll be installed on someone else's property without permission. If you know what I mean. The traffic noise at Manics does not make an attractive location for a memorial, in my opinion. The tranquility and stunning view from Cactus would be better. Great comments so far, thanks everyone! I appreciate the feedback. 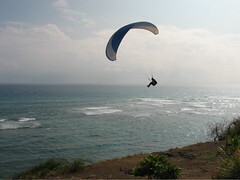 Phil showed me a rough draft of the plaque with the image of a paraglider and it looked great - they are modeling it on the picture Bob took of Johan flying at Diamond Head (shown at the top of this article). The plaque will be 8 x 14 inches. I am leaning towards installing it at Cactus, flush into the rock of our launch area. Phil says we will need an electric hammer drill if anyone has one! Otherwise a normal electric drill with a couple of masonry bits, 3/8 inch diameter. Plus it'll be easier to install without attracting lots of attention. Manics is a nasty place. I like Cactus much better too. When will the observance begin? I took some pictures and video to send to Lisbeth (Johan's Mom) She will truely appreciate this memorial to her son.